Sharks come from a family of fish containing between 400 and 500 species (depending on who you ask!). Dating back over 400 million years, long before the dinosaurs, the sharks have had plenty of time to diversify into a wide variety of forms, some of which are frankly a little on the weird and wonderful side. 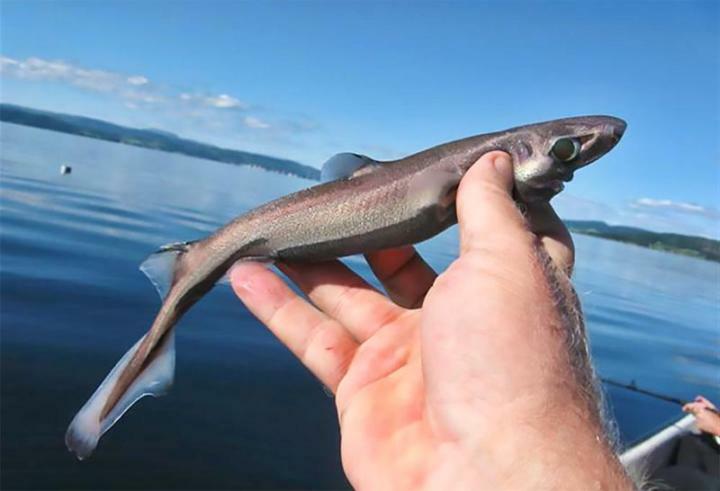 There is a shark for every occasion; plankton eating giants that reach over 50 feet (20m), tiny glow-in-the-dark deep sea sharks that can fit in your hand, sharks that can live in rivers and lakes and some that can live in the icy waters of the arctic. And that’s not to mention the better-known fearsome marine predators we usually associate with these fish. Despite all their differences all sharks do still have some things in common which define them. They all have cartilaginous skeletons, i.e. not bone; all sharks have teeth of some description and in addition they have skin covered in modified teeth. Of course weirdness is in the eye of the beholder but we think the list below represents a pretty good selection of the most bizarre and strangest sharks on the planet. There are actually quite a few species of hammerhead shark and they vary greatly in size from around 3 ft (1m) up to nearly 20 ft (6m+). What they all have in common though is a head shaped something like a hammer! To me this is quite strange – admittedly as everybody has heard of hammerheads I think they maybe don’t seem quite as weird as they are. But they are odd, enough so that there is a Star Wars character (Mowam Nadon) inspired by this evolutionary oddity. The exact purpose of the oddly-shaped head is still a matter of debate. The generally accepted use is to provide the shark with an enhanced range of vision – nearly 360 degrees. Other theories suggest it may be used to improve manoeuvering. Of all the sharks on this list the hammerhead, and in particular the great hammerhead shark (Sphyrna mokarran) are the only one to have a fatal attack attributed to them. 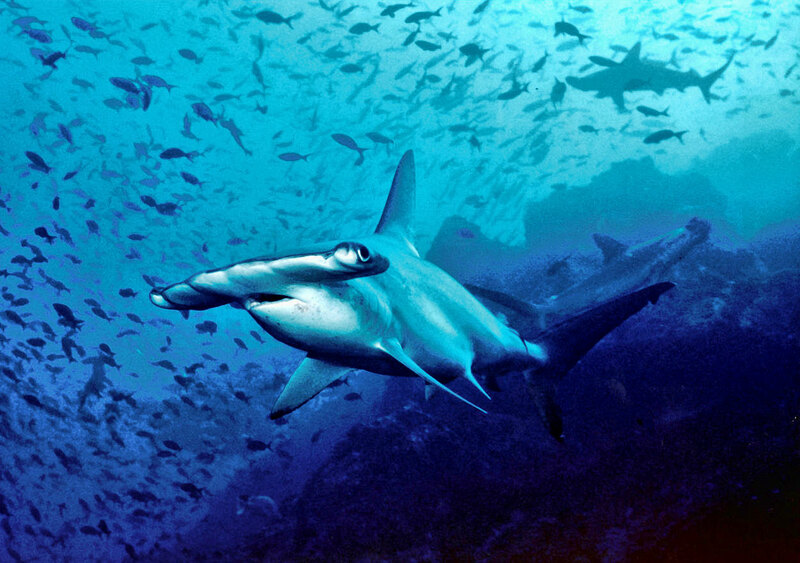 There have been quite a few reported attacks by hammerheads and they certainly have the potential to be dangerous. 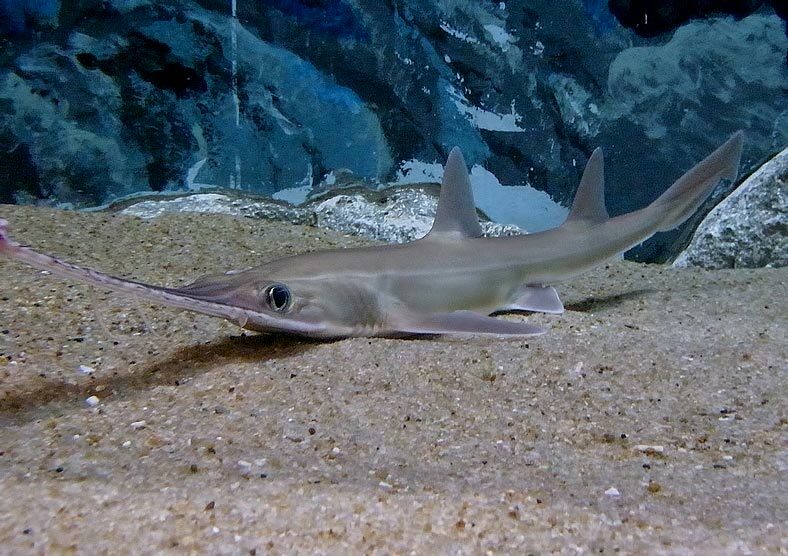 The sawsharks consist of eight species of related sharks found in the tropics around the world. As you may have guessed their defining feature is their long, flat rostrum (snout) which is lined with teeth to somewhat resemble a large saw. This saw / snout can make up nearly a third of the sawshark’s body length, which is rarely much over 4ft (1.3m) depending on species. Sawsharks are much smaller than the similar looking sawfish, which is a type of ray and can reach over 20ft (6m) in length. Whilst this appendage looks somewhat cumbersome and unhelpful it is actually essential to the sawshark’s method of feeding. They use it to both dig around for small fish and crustaceans on the seafloor and to disable prey with a slashing swipe. The saw can also be used for defence against predators such as larger sharks. Half fish, half rug, the tasselled wobbegong is instantly recognizable. Well, it is if you can see it in the first place. 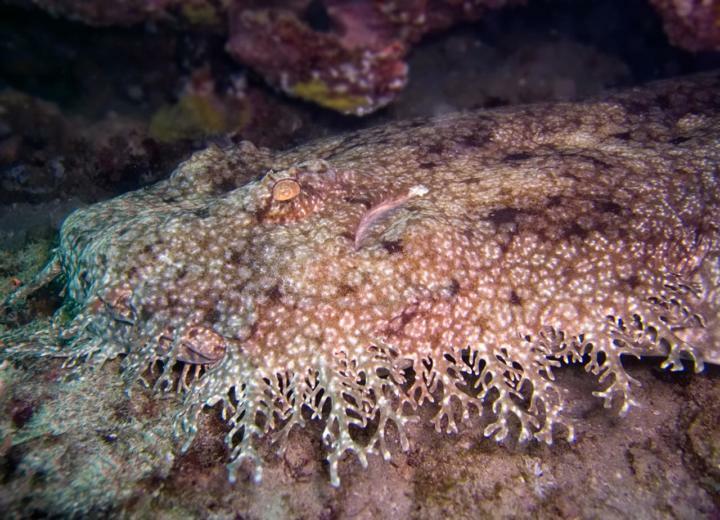 This master of camouflage blends in perfectly with the sea floor using its complex skin patterns and it frilly “beard” to break up its outline. The name is believed to be Aboriginal for “shaggy beard”. The wobbegong is an ambush predator and uses its ability to hide to launch surprise attacks on smaller fish. Lying motionless on the sea bed the shark focuses its eyes on a spot just in front of its head, and waits, and waits… When something enters that spot the wobbegong snaps into action gulping down its prey with a sudden pounce and aided by the suction created when it opens its mouth. Wobbegongs can grow up to nearly 10ft (3m) in length and are actually quite dangerous. There have been over 50 attacks recorded in Australia and although none have been fatal they can certainly give a very nasty bite. If there was a competition for the “most terrifying looking harmless animal in the world” then we could well have a winner here! Measuring up to an enormous 40ft (13m) in length this is the second biggest fish in the sea. As you can see they also have rather large mouths too. But this mouth isn’t for gulping down seals (or humans) whole. 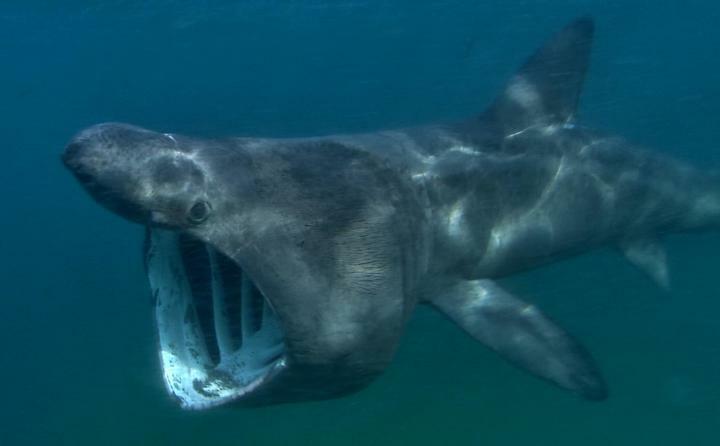 Basking sharks are gentle giants that feed on plankton which they filter out of the water. This requires them to endlessly swim in their lethargic manner with that massive set of jaws agape. That’s not to say the sight of a large triangular fin gliding through the coastal shallows on a summer afternoon isn’t enough to scare the life out of anyone in the water – because it is, I know from experience! While these massive fish are regular visitors to the coasts of many countries in the summer, little is known about where they spend the rest of the year. The old theory was they hibernated on the ocean floor for the winter. 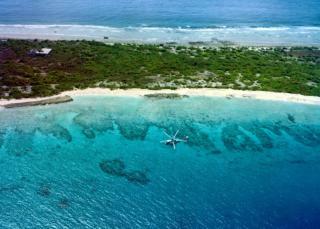 It is now known that they migrate thousands of miles, but not why. Another little known basking shark fact is they can breach, i.e. jump out of the water, like their cousins the great whites. However, this is not commonly seen. Believed to have been extinct at one time, little has changed for the frill shark in the last few hundred million years. A true living fossil, these sharks are rarely encountered as they live in the darkest depths of the ocean, over a mile (1,600m) below the surface. Appearance-wise the frill shark is certainly one of the strangest. The second part of the latin name for the shark (Chlamydoselachus anguineus) means snake-like, which sums up the body shape. The set of six gills are where the shark gets its name with their frilly appearance. These sit behind its almost lizard-like head which has wide jaws containing multiple rows of pin-sharp three-pronged teeth. Reaching a maximum length of around 6ft (2m) the frill shark is one of the hunters of the abyss. Although never observed feeding the shark is thought to hunt along the sea bed capturing prey with its hook like rows of teeth. Once it has secured its prey, it is suggested the frill shark swallows it whole, even if it is almost as big as the shark itself. 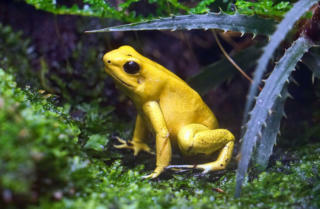 Everybody knows that the biggest shark is the whale shark, but what is the smallest species? It is in fact this little chap, the dwarf lanternshark which measures in at a tiddly 8 inches (21 cm) – not exactly ‘Jaws’ material. Only recently discovered (1985) this little fish is found in the depths of the ocean off the continental shelf of Colombia. The name of this shark tells us quite a bit about it. and we’ve explained the dwarf side of things. As a lantern shark it is one of a significant number of sharks that are bioluminescent – i.e. it glows in the dark. The lantern sharks possess light-emitting organs called photophores on their bellies which server two purposes. The first is a form of camouflage; when seen from below the fish would form a silhouette with the light coming from above, however with their underside lit up they are much harder to see. Secondly the glow attracts potential prey which the little shark then uses its over-sized eyes to spot and gobble up. Very little is known about this large shark that was only discovered in 1976. Unlike other recently discovered species the megamouth has no living relatives and came as a complete surprise. In fact biologists had to create a new family and genus to fit the shark into. 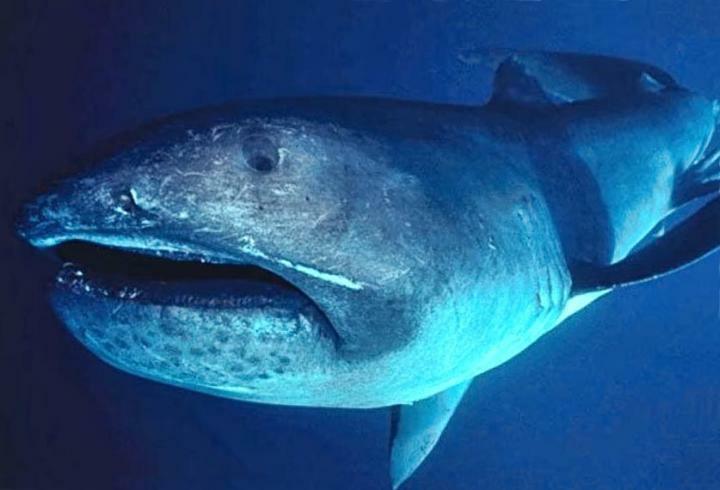 The megamouth is one of the most primitive sharks and is one of three species of plankton feeders, the others being the basking and whale sharks. Measuring in at up to 16 ft (5m) the megamouth is somewhat smaller than the other two but manages to make up for that by having a large head and massive mouth. It appears that this shark spends its time swimming particularly slowly (1.5 mph / 2.4 kph) whilst hoovering up plankton, shrimp and jellyfish with that enormous mouth. 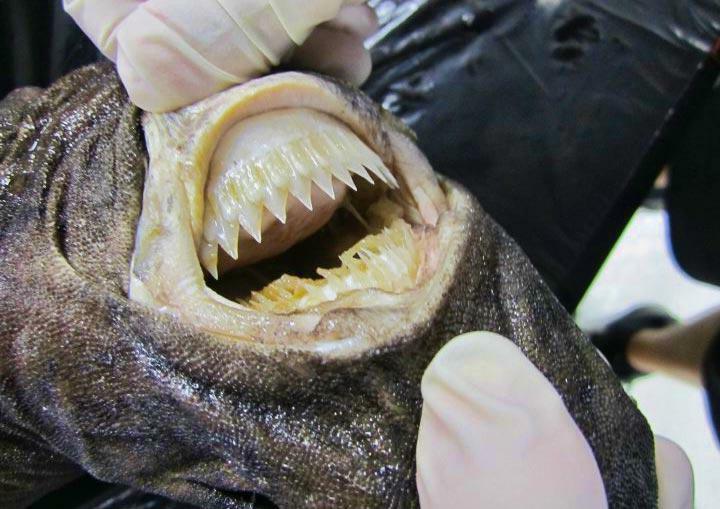 The megamouth has another trick up its sleeve – along the top of its mouth are light-emitting photophores which appear to attract plankton or small fish towards that mega-mouth. The cookie cutter is another small shark with some bizarre, if not rather unpleasant, feeding habits. Despite measuring less than 2ft (60cm) in length this diminutive shark takes on prey such as large sharks, whales and even the odd submarine! Nothing is safe. Obviously the cookie cutter doesn’t swallow its prey whole and the clue is in the name. Armed with a set of saw-like teeth the cookie cutter feeds by taking a bite out of its larger victim. Firstly it attaches itself using suction from its lips and then rotates cutting a neat circle of flesh out with its super sharp bottom teeth. These are actually the largest teeth relative to body size of any shark. 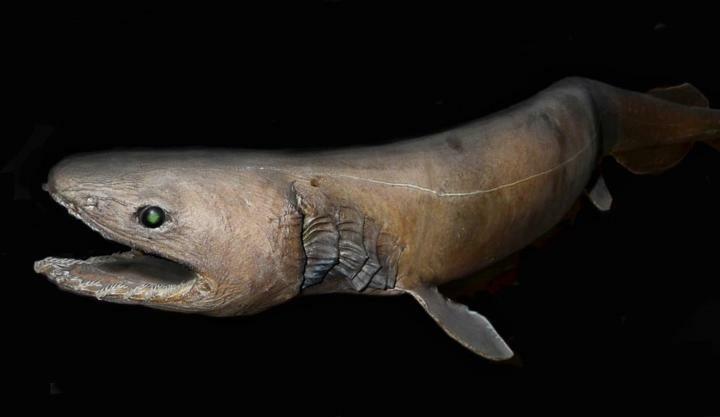 Cookie cutter sharks spend the daytime in the deep warm oceans of the world, up to 2 miles (3 km) down. As the sun sets they come closer to the surface to grab a quick meal off their unsuspecting prey. Although not generally considered dangerous there have been a few cases of cookie cutters taking a bite out of people. One such attack was on marathon swimmer Mike Spalding in 2009 while he was swimming between the Hawaiian islands of Hawai’i and Maui. The Greenland shark is a fairly substantial beast and weighs in around the same size as a great white shark. The largest specimens can be around 20 ft (7m) in length and weigh up to 2,500lbs (1,000 kg). Although not in the same league as the great white when it comes to hunting the Greenland shark still enjoys a big meal. Primarily scavengers these sharks will eat pretty much anything they can. Stomach contents have included the remains of moose, polar bears, horses and in one case a whole reindeer. It is presumed that most of these were already dead but speculation exists that they will take sleeping seals or even swimming caribou. There is little doubt a Greenland shark could take a human swimmer, but it is very unlikely anyone would be swimming in the frigid waters the shark inhabits. On the other hand eating Greenland sharks can be very bad for you as it contains poisonous trimethylamine oxide. Perhaps the most astounding fact about this enigmatic shark is their longevity. 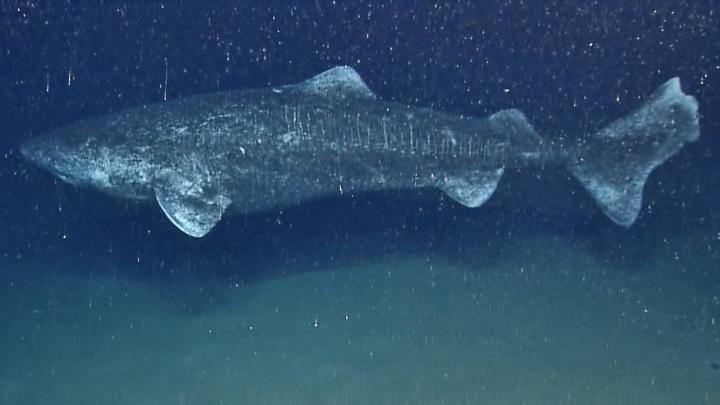 The Greenland shark is believed to be the longest living vertebrate with estimates of a life span in excess of 400 years. That means the oldest sharks alive were born when Shakespeare was alive. 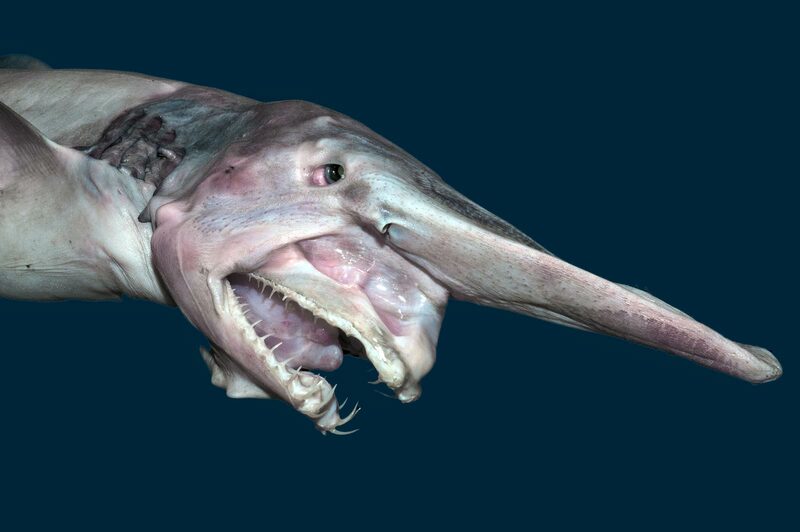 One look at the photo above should be enough to justify the goblin shark’s place on this list of weirdest sharks. 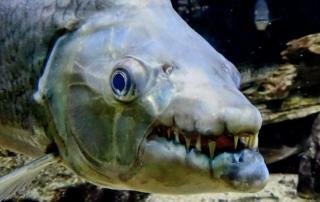 The name is possibly a disservice to goblins as this is one ugly, scary looking fish. Described as pinkish and flabby the goblin shark can measure over 20 ft (6m) in length, although 10 to 12 ft (3-4m) is more common. These sharks inhabit the twilight zone at depths greater than 300 ft (100m) where they slowly hover looking for prey to ambush. This is where that outlandish snout comes into play as it is covered in special sensory organs (the ampullae of Lorenzini) which help detect the electrical fields of other organisms. It is only when prey has been detected and the goblin shark strikes that it takes on its most grotesque appearance. With its jaws shut the shark looks merely odd. However, when the shark attacks it can shoot its jaws forward which then protrude almost as much as the snout revealing a set of particularly long and sharp looking teeth. As is the way with many of the strangest looking animals, the goblin shark is an evolutionary throwback, little changed for 125 million years.